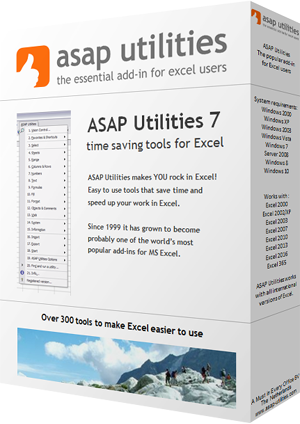 This utility will extend your selected range to the last used column on your worksheet. This way you can easily extend your selection without having to scroll to the right. This is very useful when you cannot use Excel's built in shortcuts such as 'Ctrl+Shift+Arrow key right' because of empty cells in between or 'Ctrl+Shift+End' because you only want to extend your selection to the right and not include the rows at the bottom. Very useful when for example you want to copy a formula to the right to the last used column. You can for example, use this to quickly copy a formula to the right to the last used column without having the difficulty of scrolling and finding the end of your data manually. By default you can start this utility with the shortcut Ctrl+Alt+Shift+Right Arrow.